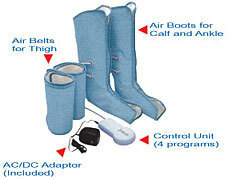 Put them on like boots and the Air Leg Massager provides a comfortable compression massage right in your home. It gently and softly massages away fatigue and tenderness. Just relax and experience the great feeling of a deep massage right where you need it. You’ll feel air chambers inflate and deflate, pinpointing air pressure to various pressure points on your body. And because the boots simulate the pumping action of exercise, your legs will actually look and feel great, after using Air Leg Massager for just 15 minutes a day.